We typically cook “the recipe of the week” for our CSA members Monday evening before our Tuesday afternoon drop-off (since by Monday evening we know what the contents of their boxes will be.) I always have a blast cooking my way through the bulk of the veggies that will be included in their weekly share. We obviously don’t have to include a recipe every week however, I think it helps folks cook with veggies that they might not normally prepare in their kitchens if they weren’t part of a CSA. Also, it’s super fun to get emails, text messages and photos tagged on instagram of our customers cooking the recipes we share! It makes my heart flutter every time. Keep sharing your Tumbleweed recipes guys! By the way, you don’t have to be a part of our CSA family to tag your recipes from the blog- I love seeing them all! Anyhow, this week our members all received watermelon radishes for the first time this season and we were really excited to share this recipe. Since this is a new vegetable for a lot of our members I thought this simple toast would be a great way to highlight this beautiful vegetable. Watermelon radishes are an heirloom Chinese daikon radish and are part of the brassica family. They are slightly spicy with a lot of crunch. We grow them in the fall but you can also find them available in the early spring at the farmers markets. They are great eaten raw, roasted and pair really well with Asian and Middle Eastern cuisine. Not only are they really tasty but they are beautiful to boot! Bright pink with a lime green rind (hence the name Watermelon Radish!) Anyhow, I hope you all enjoy this simple recipe as much as we do. The sesame seed and sea salt topping on these toasts is known as Gomashio (a Japanese condiment.) You can find it at the grocery store but it’s simple to prepare and ready in less than 5 minutes. It tastes great added to salads, soups and obviously these toasts. You’ll likely have leftovers so keep excess in an airtight container for up to 1 month and enjoy sprinkled on a variety of dishes. Alrighty, it’s time to crack open a beer and enjoy a simple, quick and tasty weeknight meal. Cheers from Tumbleweed! Heat a small skillet over medium heat. Add the black sesame seeds and lightly toast, shaking the pan often until lightly toasted and fragrant, about 3 minutes. Remove from heat and let slightly cool. Using a mortar and pestle (or the back of a spoon) lightly crush the sesame seeds and sea salt together. With an immersion blender or small food processor combine the tahini, miso, garlic, lemon, vinegar, soy sauce and water. Blend until smooth and creamy-you want a thick consistency but smooth enough to spread on toast. Add more water, 1 teaspoon at a time until you reach the right consistency. Taste test and adjust seasonings if need be. 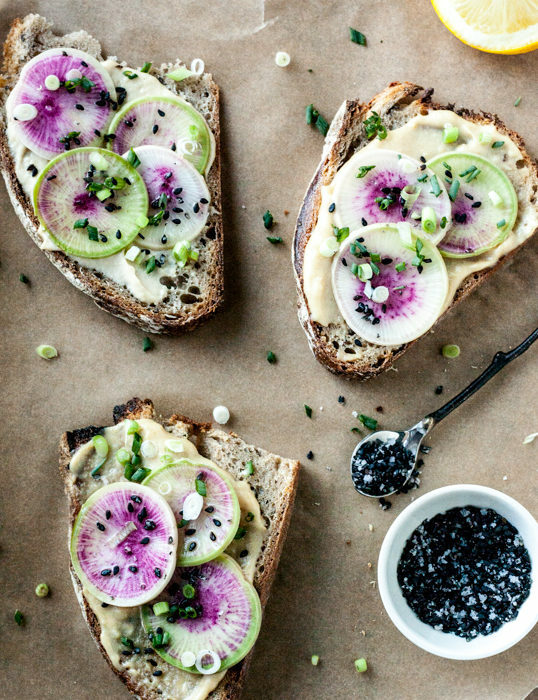 Spread the tahini-miso sauce over 4 slices of toasted bread and top with a few slices of radishes and sprinkle each piece of toast with minced scallions and a few pinches of the sesame seed/salt mixture (Gomashio) and enjoy. Looks more like a museum piece than dinner. What gorgeous radishes. Send some seed back to Hutchins for those of us in the East, please. I was there last Sunday and the joint was jumping as usual on the weekends. Went for two things and came home with two bags full. We are so very lucky to have such yummy veggies. Best to Henry! Never heard of watermelon radishes, they are beautiful. Thank you for the recipe!